sararah, knottiea0c208e4eca3f74b, knottie5df810274851bda8, knottied64e124fcb056bca, knottiefb3d0d560e2fbdcf and 168 others joined. knottie6ee0d18c21724048, knottie1997970393c1718c, knottiee11a4a36081e9ebf, knottiee9336be1a80f13cd, knottie6b89e15c17b77525 and 14 others were promoted to member. knottie6b89e15c17b77525, knottie8b4b441c7090c115, knottie55c8c6f4d4d21fcf, knottieb12f21938adbcd6f and knottie77caa0fe01ba73fe earned the First Anniversary badge. So because my fiancé and I are both military we have moved around a bit, that being said my bridesmaids are all over the place! What would anyone recommend for picking out their dresses! I want them to be able to try them on before buying, I don't want them to be to expensive, and they have to be able to order online or some how be able to get them if there isn't a store near by. I do NOT like Davids Bridal. They have put a bad taste in my mouth, what would anyone recommend? I am going country rustic for the wedding and want the dresses to be deep blue with maybe some lace. With cowboy boots? So cute. I like Lulu's too. 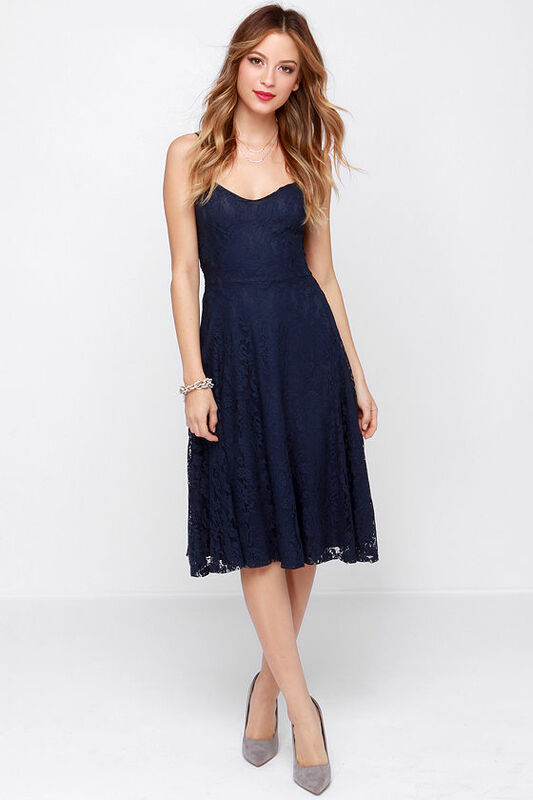 https://www.lulus.com/products/on-the-boulevard-navy-blue-lace-midi-dress/186298.html It's out of stock now but will be back in a month or so. Returns are easy too. JCrew, Ann Taylor, BHLDN are all good options too. Find a designer that is carried by bridal stores in all or most of the cities where your maids live. That way they all have a chance to try the dress on and get their measurements taken. Then pick a store (likely one near you) that they can all call in and order from. Ordering from the same store at the same time ensures that all dresses come from the same dye lot so the dresses are the exact same color. Some stores even offer a discount if you order so many at once. Most, if not all, stores will ship, so once the dresses arrive, they can ship the dresses to your bridesmaids and they can take the dresses to their local tailor for alterations. I've had to do this for three (yes, three!) of my friends' weddings and it's worked out perfectly every time. Bari Jay and Alfred Angelo are two great options since they are popular and can be easily found. Long Dress $179 * I'm actually wearing this dress to wedding in peach, as a bridesmaid. "If you really want something you don’t stop for anyone or anything until you get it". I own the second one that PP posted, the Bariano's Oceans of Elegance dress. It took me 3 tries to get the size right. I'm in the military, so my back, shoulders, abs, and chest are pretty muscular. I'm a size 2, but that dress had sizing that made me feel like a crossdresser. And, as aforementioned, those chest muscles of mine mean I'm an A-Cup. I was still insanely boobielicious in it. And I'm 5'5 according to the Army, and it was way too long. Just might want to keep that in mind. It's not one I'd do for a BM dress (I think PP has a similar dress by a different designer. I don't think Bariano ever did one in peach, just navy and wine, I stalked that dress for like a year on his site and Lulu, I had a google alert for it I wanted it so badly). It's cut down to my sternum. Super low.